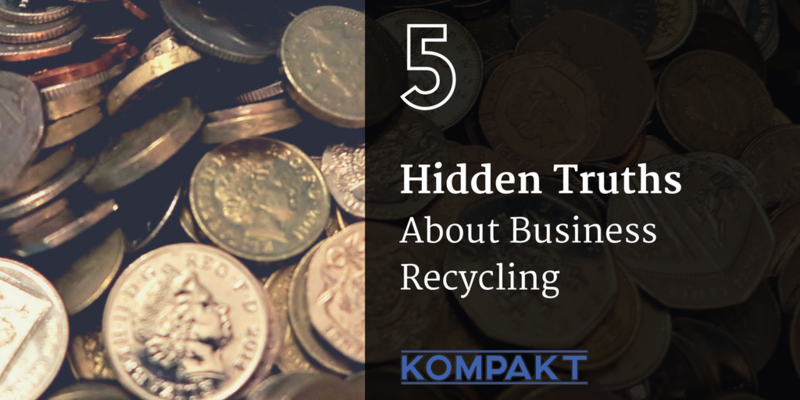 5 Hidden Truths About Business Recycling! Recently we dug deep into our ‘secret locker’ of information that waste management companies don’t want you to know. Now, we are back again, scooping out more hidden truths about business recycling that you really need to know if your business creates waste. We’re still singing from this hymn sheet, because there are so many businesses out there who are yet to hear our song. Listen to this, waste management companies charge businesses to take away their waste. This waste then goes to a sorting centre, where the the valuable recyclables are extracted, baled and SOLD into the recycling market, at a profit. So, not only are they being paid to receive the material, they are being paid to move it on too! Now, of course, waste management companies have their own expenses to cover, like staff, vehicles and landfill taxes, but, what they don’t want you to know is that if you separate your recyclable materials and bale them yourself, you can easily sell them. This way, they only receive the waste that you can’t sell, and so can justify charging you to get rid of it. Remember the last time you had a bin collection, can you 100% say for sure that there was no more space left in any of the bins for more rubbish? Why pay 100% of the price to empty 50% of a bin? What waste management companies don’t tell you is that the more you can squeeze into one bin, the less you are paying in the long run. Small compaction can reduce waste to a quarter of the size, shrinking its volume and removing the trapped air, meaning you could effectively reduce the number of bins you really need! This is one of the simplest aspects of business recycling to consider. We touched on this in part one, but it’s important to explain in further detail that simply removing your recyclable waste from your general waste stream might not be enough. The key is to bale the material and store it for sale. Loose plastic is not particularly useful, even in large quantities, however, a tonne of baled plastic could earn you several hundred pounds. Material must also be kept dry and free from rot and mould. In the competitive capitalist world that we live in, we are lucky to be free to choose from a multitude of businesses when we come to spend our money. Factors such as price, quantity and quality are common for making purchasing decisions, but in recent years, the influence of environmental responsibility has impacted heavily upon the conscious consumer. It’s proven that businesses who are dedicated to reducing their carbon footprint, benefiting the environment and improving recycling rates are more likely to attract new customers and keep old ones, through a psychological trait that improves loyalty. So, business recycling can in fact help you sell more! In the same sense that customers are attracted to more responsible business decision making, staff are also encouraged to stay with a business that has a strong identity and ideology. There are an abundance of case studies and whitepapers that can be found on the topic of CSR and staff retention and engagement. Statistics indicate that businesses who engage with the local community, environment and in responsible practices are more likely to keep their best staff for longer and improve their productivity. We knew! Information about business recycling is coming to light in great quantities, and those who are interested are discovering more and more psychological, social and environmental benefits to the age old art of taking waste and reinventing it into something new and useful.